Our office is on the 13th floor of the Marsland Centre. Take the elevator to the 12th floor and come up the spiral staircase to our reception area. Stanley Marsland, the first president of Marsland Centre Limited, founded the company after selling Marsland Engineering Ltd., the business he began as a 19-year-old in 1929. A company started by an entrepreneurial teenager just as the Depression was about to hit might have seemed a longshot for success. This would be especially true since it specialized in new radio technologies and electronics that were just crossing into the mainstream. But the company founded by Stanley Marsland in 1929initially called Marsland Radio Servicewould evolve and grow into the largest industrial employer in the city, and Canada's largest privately-owned electronics business. 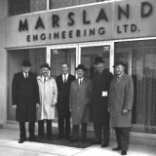 At its peak in the 1960s, Marsland Engineering employed 1,400 people in Waterloo, and occupied a 300,000 square foot facility at the corner of Weber and Columbia (now the site of Manulife Financial offices and the La-Z-Boy manufacturing plant). It was one of the first technology companies in an area now known as a high-tech centre. In a recent study by PricewaterhouseCoopers, Marsland Engineering was listed as the 3rd technology business in "Canada's Technology Triangle"the area that includes the cities of Waterloo, Kitchener, Cambridge, and Guelph. The company was a major supplier to Northern Electric (which later became BNR, now Nortel Networks) and IBM, and operated its own R&D centre with scientific and engineering staff. A diverse range of complex electromechanical equipment for industry and government were designed and manufactured by Marsland Engineering. Products included microwave components, plotting computers, nuclear instrumentation, TV and FM tuners, rectifiers, relays, amplifiers, and loudspeakers. In 1969, Stan Marsland turned his attention on another new company that many thought was unlikely to succeed. At the time, there were no high-rise office towers in Waterloo, and even today - 30 years later - there is nothing comparable to the multi-tenant prestige building that Marsland envisioned and built. "It will be a very fine prestige building," Marsland told The Chronicle in a 1969 interview, "something of great credit to the community." He acquired the property at the corner of Erb & Albert from the City of Waterloo. This was the site of the historic town hall which was abandoned by the city and had become run-down. By the time the town hall came down in August 1969, construction of the Marsland Centre had already begun. Today, the original town hall cornerstone is on display in the Marsland Centre lobby. The finished 13-storey tower opened on May 14, 1971. The City moved their offices to the building from Waterloo Square that year, and remained a tenant until occupying the City Centre. Stan Marsland retired to Bermuda in 1974 and lived there until his death in 1988. 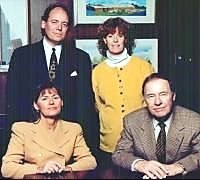 Today, Marsland Centre Limited continues under the management of Larry Marsland, his son Brad Marsland, and daughter Melanie Marsland, who manages the company's Northfield Racquet Club » facility. A four-storey addition and a parking garage were added to the Marsland Centre in 1993, and vacant space in the building is snapped up very quickly these days. The Marsland Centre has become the successful prestige building Stanley Marsland conceived as a lasting contribution to his community.